Thanks for visiting my blog today. Unfortunately (of sorts), I’m back with another sympathy card today. They just are not ending! It’s a good thing cards are beautiful. There has to be something redeeming about this season. I consider this card to have two recipients. It was first intended to go to a dear friend who lost her grandmother – but in my hit-and-miss-mostly-miss craft room time as of late, I’d managed to lay it out but not glue it together before seeing her at an event. So I showed her a picture. She seemed to love it and then told me to mark sending it off my to-do list. Best news ever! …And then a couple of days later I heard about the passing of a longtime church member. 😦 I sadly trudged back up to the craft room and glued it together (being very thankful I was that far along considering my utter lack of time), and I mailed it off this week to his widow. Sigh. So many people to lose lately. I don’t like it one bit. But I hope I can bring some comfort and a bit of beauty by remembering and praying for those left behind. The card mechanics are pretty simple. White A2 card base with scraps of Stampin’ Up’s Always Artichoke (dark green) behind some leftover SU Designer Series Paper (DSP). I don’t remember the name of the pack it came out of; I just saw this decently sized piece and thought it was pretty enough to use as a focal point. Initially it was a complete rectangle, but I had thought to echo the cut-out corners in the sentiment. Alas, I grabbed the wrong punch…and then forgot to “highlight” the corner with a pearl or gem, though I did sprinkle a few pearls elsewhere. Oh well. You wouldn’t have known, right? The two butterflies came from generous RAKs (Random Acts of Kindness) from crafty acquaintances I’ve never actually met (but I love how Facebook brings us together…), so I can’t tell you what designers or machines they are from. They are stunning, though. The big yellow one came already assembled, and I have two more like it in other colors to use at a later date. I topped the littlest butterfly with two tiny pearls as well. The “With Deepest Sympathy” tag came from a pack of sentiments that I’ve now used the last of. (*cheer*) I got it years ago at JoAnn Fabrics in one of those premade card sections like David Tutera or somebody. Pretty easy. The inside was stamped in Stampin’ Up’s Mellow Moss ink (retired). There are a few favorite colors that I just love and continue to use. This one matches a lot of things I create with and has a good muted, vintage vibe to it. The stamp on the left came from a retired Stampin’ Up set called Words of Wisdom. It has a lot of great Bible verses and sayings. The stamps on the right are both from a favorite polyclear Hero Arts sympathy stamp set. I go to it often, but it was my first time using that flower. It stamped beautifully and I will be returning to it in future cards. In Stampin’ Up news, we’re gearing up for the November 1 release of the suite called Snowflake Showcase. These products will all be sold separately – no bundle – and will be available for sale for ONE MONTH ONLY in November. There are two stamp sets, a gorgeous die set, little metal snowflake trinkets that are a little flatter than ones they’ve had in the past (which makes them perfect for mailing on a card or including in a scrapbook), and flocked white “velvet” paper. I personally can’t wait to use that paper. 🙂 A similar treatment is used in the Santa’s Workshop DSP and Memories and More Card Pack for highlighted little bits like candy canes and Santa’s hat, and it feels amazing! Just so pretty and a fun detail to touchable cards. Below are pictures of the upcoming release. Once items sell out, that’s it! So be sure you get them sooner rather later if you’re interested. 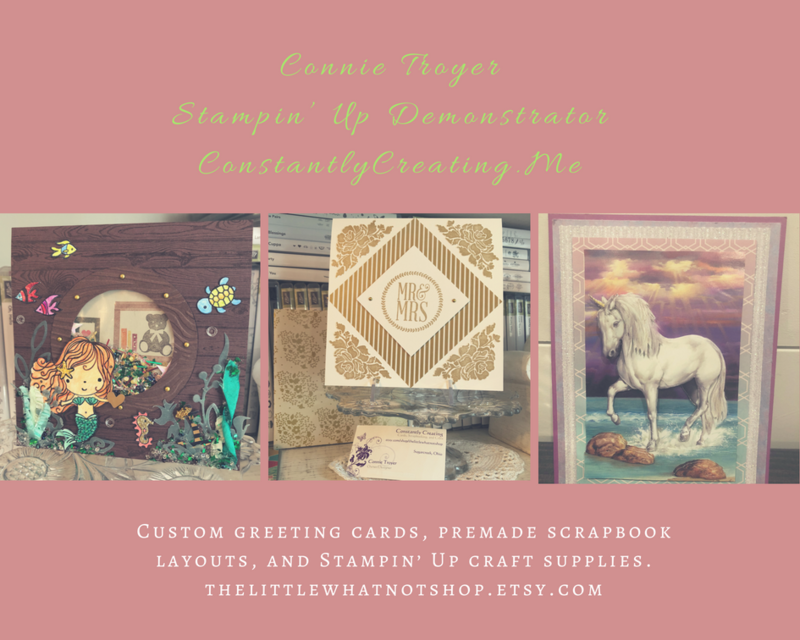 If I can help you order, you can find my Stampin’ Up shop link in my sidebar or at https://www.stampinup.com/ecweb/default.aspx. I’m happy to be your demonstrator and get you awesome products so you can create special things. 🙂 Thanks for considering me! I needed to send out two cards with RAKs (Random Acts of Kindness for craft happy mail) this month. This is the first one; they’re both going to Canada. I embossed my Stampin’ Up Tangerine Tango cardstock card base with the Swiss Dots embossing folder and added “Hello” patterned paper from a UK magazine on top. On the right-hand side of the card, a little embossed bird is visiting his butterfly friends. I’m not sure which embossing folder he came from, but he’s cute! The yellow butterfly is from Tim Coffey and K & Co, and the smaller butterfly is a random punched piece.